A list of all the greyhounds pending adoption through Greyhound Crossroads. Although some of these dogs have been on here a long time, they are not available for adoption. 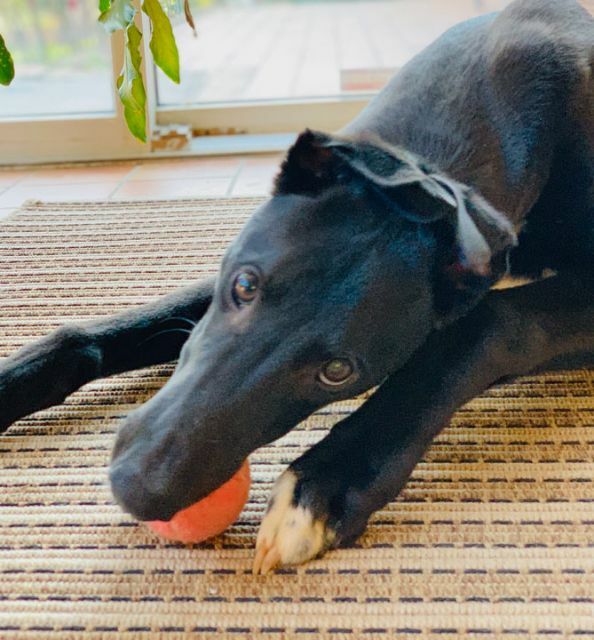 In most cases the dogs are safely in their adoptive homes and their owners have not yet made a contribution towards their adoption and/or completed the paperwork to make it official. Timmons just arrived from the Blanchard Kennel at Orange Park in Jacksonville FL. He raced all over though starting out at Southland in Arkansas then going to Naples Ft Myers in Florida, then to Dubuque in IA, back to Southland in AR, Wheeling WV and finally Orange Park in Florida. Timmons was good racing 94 races and getting up to A level. He even placed in 4 Stakes Races, getting a 2nd, two 3rds and a 4th. Timmons raced at 73lbs and his sire is Dox Out Of Peace and his dam is Boc's Sluicey. He is a very good boy and as you would expect travels well and takes everything in stride. He picks up quickly on things and seems very bright. He figured out how to take his muzzle off with no problem. He crates quietly and has done great with potty training. He gets along well with the other dogs in his foster home and was also fine with the small dog he met. He still needs cat testing but he has seen a few cats outside and hadn't gotten excited about them so we think he is likely to pass his cat test. Timmon's foster mom says he is one of the easiest fosters she has had. He is good on leash and corrects easily. He is a pretty calm guy that will turn 4 on June 27th. What a looker with all that eyeliner! 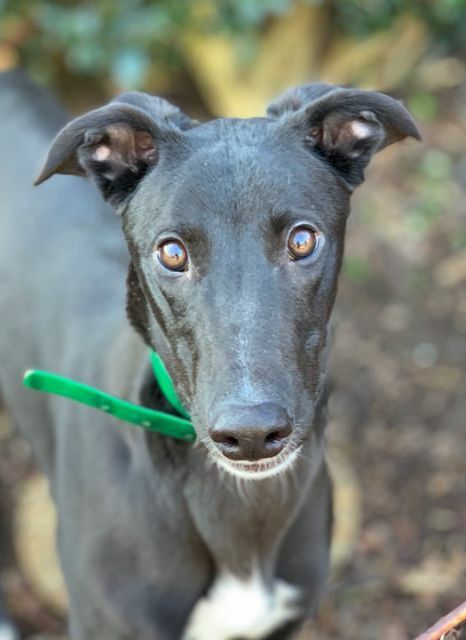 Shocker is a beautiful black female that just arrived from the Blanchard Kennel at Orange Park Track in Jacksonville. She also raced briefly at Southland in Arkansas and Wheeling in West Virginia without any luck. She raced 71 races but only won 5 races. She mainly placed at the lower C and D levels and wasn't very competitive. Shocker raced at 67lbs and just turned 3 on March 4th. She is young but is going prematurely gray in the face. Shocker is very outgoing and sweet. She gives kisses and loves her foster mom and the kids in her foster home. She is fine with their small dogs but still needs tested with cats. Shocker's sire is TMC's Remedy and her dam is Trip Home. Fired Up arrived with two other puppies Paradise and Paragraph but isn't from the same litter. He is a shiny black boy that is slightly older than the other puppies being born on on September 18th. His sire is Flying Fired Up and his dam is Fiesta Pauline. He is a wild, friendly puppy that is around 50lbs and will get up into the 70s most likely in the next couple of months. His owner decided not to race the pups probably due to racing being ended in Florida and most of the race tracks in the country shutting down. 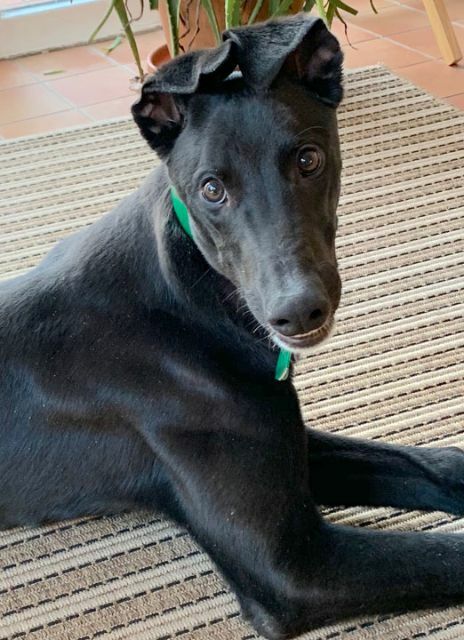 Greyhound puppies are very expensive to raise and train for the race track when it is unlikely they will have tracks to race at when they are old enough to race. 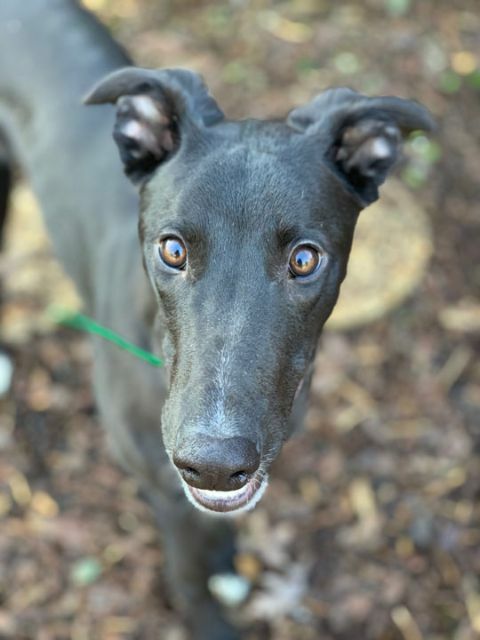 Fired Up has had none of the training the retired racers get and has just been on a farm running and playing with this littermates so far. He has not been collar or leash trained yet. He has had no potty training or manners training and has never been in a house before. He was at the Birmingham Race Course adoption kennel for a few weeks so has had a little bit of crate training there. 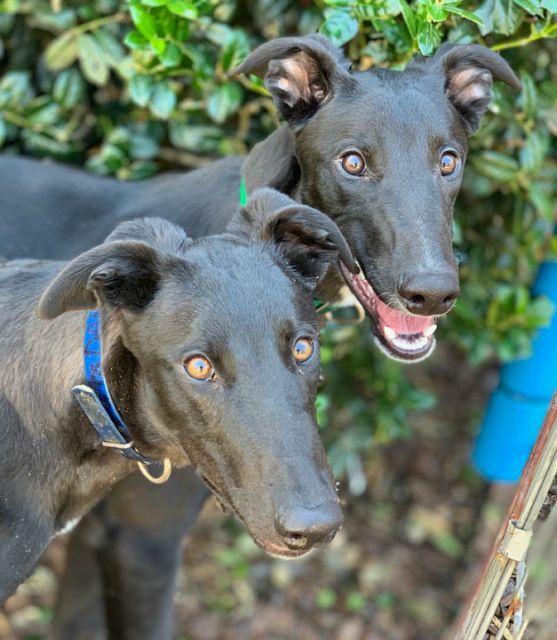 Greyhound puppies need large fence yards with plenty of room to run. Fired Up will need a home with dog training experience and puppy experience that is willing to work with him to teach him all the things he needs to know to be a good pet. Because he is a big, excitable, wild puppy, he needs a home with older kids or no kids. He is just too wild and rough to live with toddlers that he could knock down. Greyhound puppies are wild and hyper like any other puppy but are bigger than most and can run at nearly 45mph so can be much more destructive than most puppies. They are nothing like the calm, well behaved, adult couch potatoes we typically get when we get retired racers. More as we get to know him. Fired Up is a happy, friendly guy. He is picking up on collar and leash training very fast. He still resists going in his crate but crates pretty well once he is in there. He does like to bark and is pretty vocal. He will happily bark to get your attention when playing and will bark in his crate if not corrected. He corrects very easily. He is learning not to jump on people and seems to be a fast learner. He is very sweet and will just stand next to you for love for a long time. He seems pretty calm for a greyhound puppy. He still loves to play and run though and needs a lot of exercise. He is doing good with the 15lb Italian greyhound in his foster home that lets him know that he doesn't want to play with him. Fired up does play pretty rough, so would have to have a lot of supervision and rules about playing gently with small dogs if he goes to a home with small dogs just because of his size and activity level. Brandy just arrived from the Bolton Racing Kennel at the Sanford Orlando Race Track. She raced 62 races mainly at the lower C and D levels but she did win a few races. Her sire is Golden Squire and her dam is B My Merlot. We placed her littermate B Dom Perignon awhile back. Brandy raced at 61lbs and will turn 3 on May 18th. She is mostly red without much of the black brindle striping, so is very striking and unusual. She is a silly, happy girl. She loves being close by and getting ear rubs or any type of affection and petting. She is great on leash and travels well. She passed her cat and small dog tests easily and has been living with kitties in her foster home. Her foster home has decided that they want her to stay. Jayhawk raced 60 races at Palm Beach and Mardi Gras Race tracks. He got up to A briefly and also competed in a couple of Stakes Races so he was pretty good. He retired in September. Jayhawks racing owners and foster home are a couple of our volunteers. His sire is the famous Djays Octane and his dam is Craigie Joplin. Jayhawk turned 3 on October 7th. He raced at 73lbs. 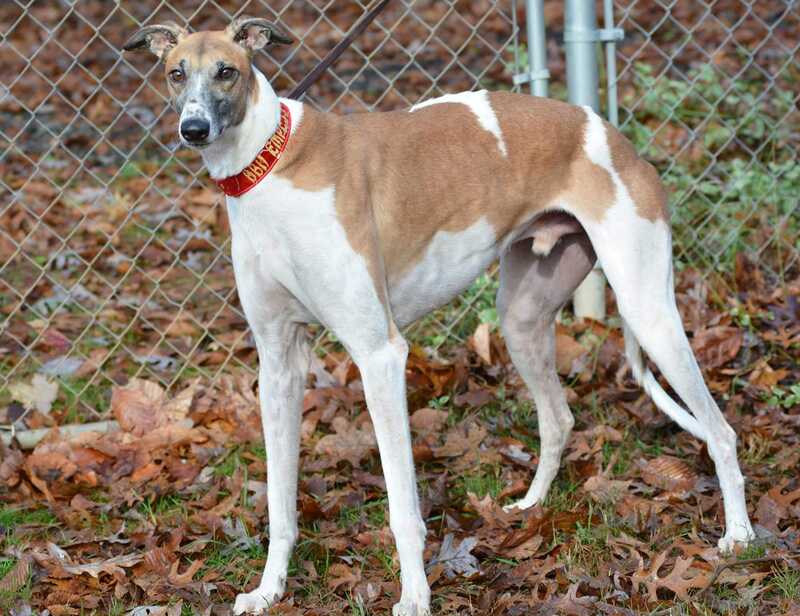 Jayhawk is a handsome white and red boy with a white blaze up the center of is nose and white all the way around his neck. His red is mainly on his back and head with the rest of him being white. Valry just arrived from the Birmingham Race Course, where she raced most of her 94 races. She also raced briefly at Mobile and Palm Beach Tracks. Although she raced a lot of races she rarely won and mainly just placed at the lower levels of racing. She is a small black girl that raced at 58lbs. She turned 3 on June 27th. Valry's sire is the famous Oshkosh Slammer and her dam is Atascocita Davia. She is a friendly, happy girl with a tail that wags a lot. She is pretty calm and very sweet. Valry passed her cat and small dog tests without much interest in either. She seems to like the young boy in her foster home so should be good with kids. She travels really well too. Bebe came in from the Waverider Kennel at Daytona Beach. She is a 62lb black female that is the daughter to a girl we placed, Wanna Rumble and we also placed her grandmother, Wheelie Cool. Her sire is Pat C Clement. We have been waiting on her to retire for some time now. The owners of her mother are fostering her and plan to adopt her if she fits in well with their family. So Bebe is not available for adoption at this time. Bebe raced 170 races and got up to B level winning some and placed a lot. She turned 4 on July 13th. 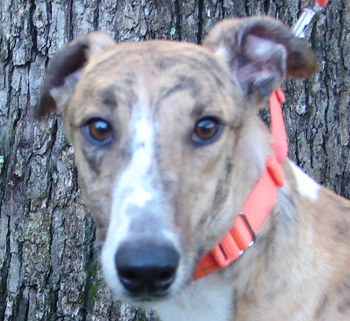 Bebe has been around children from 5 to 13 in her racing kennel. The kids help their mom care for the dogs and curl up in her kennel with her and take naps when they get tired. Bebe passed her cat and small dog tests easily and is living with a kitten that she is good with. She has settled into foster care well and is very sweet and well behaved. Bebe has a rub mark on her nose from wearing her muzzle. Fox came in initially from the CTW kennel in Wheeling WV. He is a cute little red male that raced at 69lbs. He turned 5 on September 18th. His sire is CTW Base Camp and his Dam is CTW Melodramatic. Fox is a calm, quiet male. He is pretty good on leash and well behaved. He is a happy sweet boy that should be an easy addition to any family. So handsome too. He is doing great with the small white italian Greyhound in his foster home and was afraid of the cat he met and wouldn't go near it. Fox travels very well and just gets in the car and lays down calmly. He is very snuggly and loves people. After being in an adoptive home for nearly two years Fox mistook an outside cat for a bunny or a squirrel and killed it, so is now looking for another home. 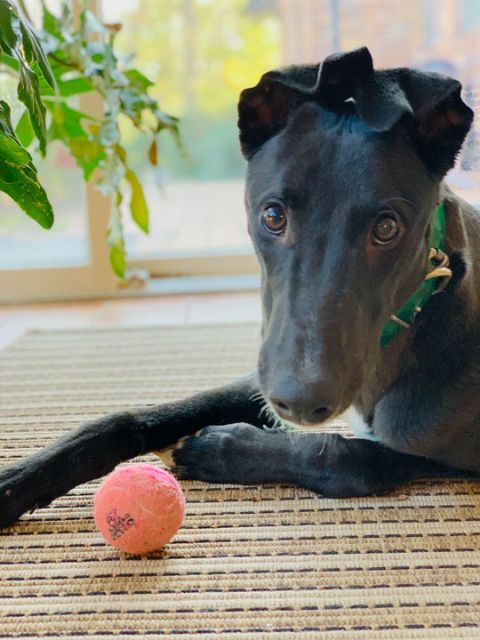 We stress to adopters that no greyhound should ever be trusted outside with cats because they could mistake a cat in the bushes for something else. Greyhounds are only good with indoor kitties and shouldn't ever be around outside cats. Fox is still fine with indoor kitties but because of this mistake he has to find a home with no cats at all. Sweet Senior! 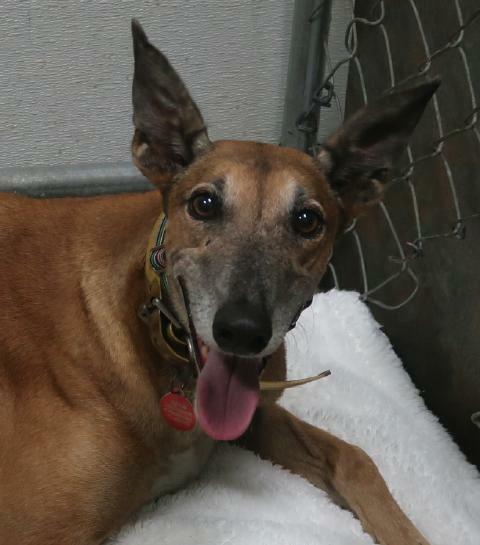 Leena raced at Derby Lane, Naples Ft Myers, Sarasota, and Palm Beach Race Tracks. She was moved around a lot looking for a track she could be competitive at. After 25 races and only 1 win her owners decided she wasn't cut out to be a racer and retired her. We placed a couple other pups her mom had too. Leena is a pretty, red brindle female with white on her feet, chest and tail that can be sensitive and a bit timid at first. DOB 10/17/06, she is 11 and will turn 12 on October 17th. Since she is a senior Leena qualifies for our reduced adoption fee of $250. Leena has been in an adoptive home since December of 2010. Her family is having to move in with their father to care for him and they cannot bring their 3 greyhounds with them. 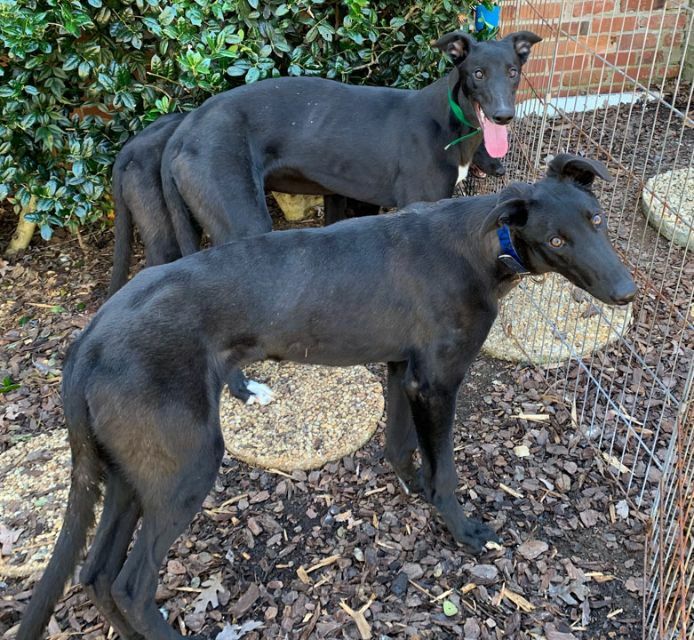 They have made the decision to re-home their 3 senior greyhounds Leena, Rumble and Razor. Leena and Rumble are both 11 and very bonded. They sleep curled up together and often choose to sleep in the same crate together and do not like if if the are put into crates separately. It would be nice to find them a home together, but we understand that may not be possible, so will consider placing them individually. Razor is 8 years old and his owners believe he would do fine without the other two. All have the same sire Maryville Rumble and all are brindles. Leena's dam is Too Shy To Say. They have been living with cats. They have not lived with kids but have been fine with children that they have met. The photos we have now of them are from when they were younger.